The symbol dial system allows you to easily set up combination dials with any symbols of your choice. You can use numbers, letters, and even characters from different languages. Symbol dials can be used in puzzles where players must figure out the correct combination to enter. As an alternative to the number input which forces you to use all of the digits from 0-9, this system allows you to specify which numbers you want to use. For example maybe you only want 1-5 to be available for selection. The digit is a number that represents which position the digit is in, from right to left. 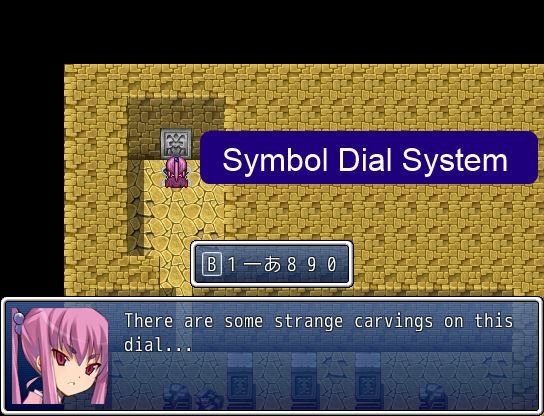 Symbols is an array of symbols that the player will be able to scroll through. 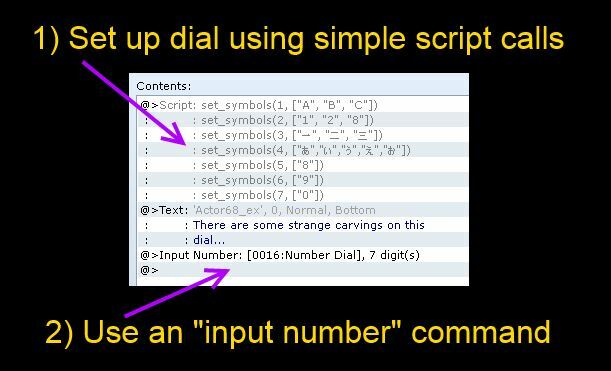 Once you have set up your symbols, you can simply use an “input number” command to show the symbol dial. 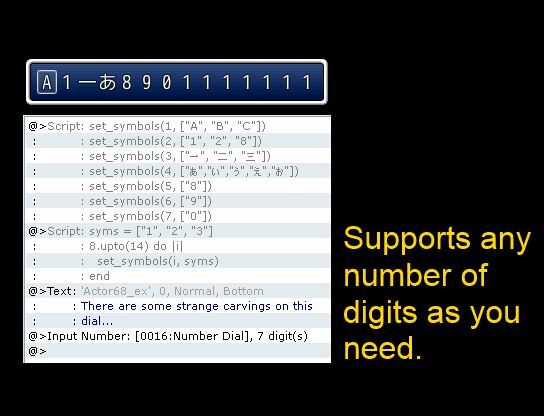 You can have any number of digits, and each digit can have any number of symbols. The number of digits that will be displayed depends on how many you have set up. Once the player has decided on what they will enter, the symbols that are displayed will be stored in the designated variable as a string. 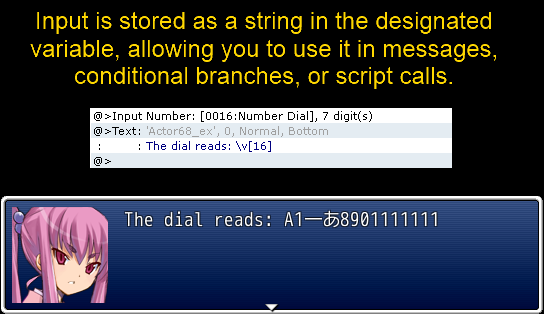 You can then perform string operations using script calls in your conditional branches to handle user input. 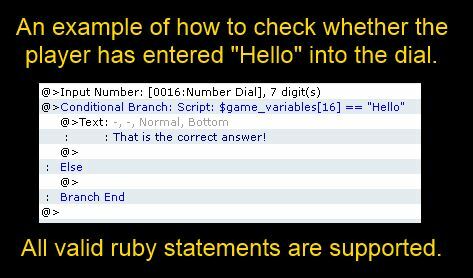 Which will check whether the value stored in variable 16 is equal to the string “Hello”. Note that this system is case-sensitive. Which will check whether the value stored in variable 16 is greater or equal to 1204. If you are familiar with Ruby you will be able to come up with all sorts of conditions. mine is showing ” wrong number of arguments …..etc. What is the script call? OK Boss all systems working.Ryogarshimasta! How or where do you specify the variable used? When you use the Input Number command it will ask you to specify a variable. The input processing command says it’s setting it to variable 16, while your condition is using variable 41. You are missing a [ after the first number (which specifies the column) and before the second symbol, which is the start of the list of symbols to use. I have tried for 3 hours straight and it still won’t work! the amount of digits in the input number command! I don’t want to be a pain but could you please help? Can you post a screenshot of your event? And make sure you're using script calls and not comments. Another excellent script, thank you. Thanks for the feedback. It would be great to see how others use it. Ooh, nice and efficient. I like it. Thanks.